They are highly effective in extinguishing Class A, B, and C fires. Clean agents are required to be electrically non-conductive, which means they won’t short-out electronic equipment or thermally shock delicate circuitry. They are also required to leave no residue upon evaporation, which reduces clean-up costs. They are more environmentally-friendly than the halon-based agents they replace. Clean agent systems are particularly well suited for sensitive environments such as server rooms, telecommunication sites, data centers, control rooms, museums, power plants, laboratories, art galleries, and more. Basically a clean agent system is a great option for any enclosure that you may not want to use a sprinkler or risk getting the high value assets wet. But, they must be properly maintained, which requires regular inspections and testing. In keeping with our goal is to provide the information you need to ensure that your fire suppression system will function properly in the event of a fire, this article offers an overview of the clean agent inspection requirements and those pertaining to testing and maintenance in the 2015 edition of the National Fire Protection Association (NFPA) 2001, Standard on Clean Agent Fire Extinguishing Systems. NFPA 25 Standard for the Inspection, Testing, and Maintenance of Water-Based Fire Protection Systems. There are two types of clean agent systems – inert gas systems and halocarbon systems. These inert gases suppress fire by lowering the oxygen in the space to below that required for combustion. In contrast, halocarbon systems suppress or extinguish fires through heat absorption. Clean agents are stored in cylinders and are discharged through a fixed piping system at concentrations calculated based on the area they are intended to protect. There are a number of clean agent fire suppression systems on the market today. You can find our comparison of the three most popular systems here. Chemicals or mixtures of chemicals that rapidly oxidize in the absence of air. Chemicals capable of undergoing autothermal decomposition, such as some organic peroxides, pyrophoric materials, and hydrazine. Both types of clean agents are safe for occupied spaces. Inert gas systems use many of the same gases found in the Earth’s atmosphere. The air we breathe is usually about 21 percent oxygen, but most people can breathe with as little at 12 percent oxygen. So, while inert gas systems will reduce the oxygen in a space to about 15 percent, which is below the level a fire needs to burn, there is still enough oxygen in the air for people to breathe. In contrast, halocarbon gases are man-made and could present a risk to humans at very high concentrations. However, those used in clean agent fire suppression systems have all been rigorously tested to determine safe concentrations for human exposure, and the codes require that halocarbon clean agent systems must be installed with the proper design concentration. Some clean agent fire suppression systems use refillable containers while others rely on pre-filled, factory-charged containers. Both types of systems must be checked at least twice a year to ensure they contain the proper amount of clean agent and that the container is properly pressurized. Liquefied halocarbon clean agent systems – These systems are measured in terms of both the volume of clean agent in the container and the pressure at which it is contained. For containers equipped with a pressure indicator, if there is a loss of more than 5 percent of the quantity of clean agent or a pressure loss of more than 10 percent, the container must be refilled or replaced. If the container doesn’t have a pressure indicator, it must be refilled or replaced if there is a loss of more than 5 percent of the clean agent. Systems that use inert gases – In these systems, the amount of agent in the container is determined by the pressure within the tank. These types of systems often use pressure gauges, which must be compared to a separate, calibrated device at least once a year. If the inspection of the container reveals a loss of pressure (adjusted for temperature) of more than five percent, the container must be refilled or replaced. Factory-charged, non-refillable containers without a pressure indicator must also be checked twice a year and replaced if more than five percent of the agent is lost. All clean agent containers that have been in continuous service without having been discharged must undergo a complete external visual inspection every five years, or more frequently if required by local regulations. U.S. Department of Transportation (DOT), Canadian Transport Commission (CTC) and other clean agent containers of similar design must be retested prior to recharging if more than five years has passed since they were last tested. For halocarbon clean agent containers, a complete visual inspection as described in 49 Code of Federal Regulations (CFR) for the transportation of hazardous materials will suffice. Containers for inert gas clean agents must be tested in accordance with U.S. DOT, CTC, or other similar design and requalification regulations. If the visual inspection indicates the container might be damaged, the container must be subjected to additional strength tests to ensure it can hold sufficient pressure to function properly in the event of a fire. These inspections should be made only by trained technicians well-versed in both the requirements of the NFPA 2001 and those contained in the Compressed Gas Association (CGA) Standard for Visual Inspection of Steel Compressed Gas Cylinders. With each inspection, the technician must record the results on a tag permanently attached to the cylinder and on a container inspection report and furnish a copy of the report to the system’s owner (or authorized representative). The owner of the system is required to retain all container inspection reports for the life of the system. Hoses must be inspected more frequently than containers. At least once a year, all hoses should be examined to ensure there is no visible damage that could compromise their ability to function. If the visual inspection indicates any damage, the hose must either be immediately replaced or tested. In addition to annual inspections, all hoses must be subjected to hydrostatic testing tested once every five years at a minimum. The NFPA 2001 provides step-by-step instructions for hydrostatic testing, which is a rigorous process that must be conducted in a protective enclosure to allow the technician conducting the test to safely observe the test from the outside. During hydrostatic testing, the hose is disconnected from the system, filled completely with water, and then subjected to 1.5 times the container pressure for one full minute to observe any distortion or leakage and to determine if the hose assembly, including the couplings can maintain adequate pressure without damage. Hoses must be thoroughly dried prior to their reconnection, and if heat is used for this purpose, care must be taken not to exceed the manufacturer’s recommended temperature to avoid damaging the hoses. While hydrostatic testing is necessary to ensure the integrity of your system’s hoses, it can represent a rather costly maintenance requirement. As a cost-effect alternative, Koorsen recommends simply replacing your systems hoses instead. This saves the cost of conducting hydrostatic testing, which often results in one or more hoses needing to be replaced anyway. This approach not only provides for more cost-effective compliance but also greater peace of mind – with new hose assemblies every five year, you can be confident that they will work when you need them. The NFPA 2001 requires the enclosure to be inspected at least once a year, unless you have a documented administrative control program that addresses barrier integrity. To determine if any new penetrations have been made in the firewalls that help to protect the enclosure. Penetrations could result in leakage of the clean agent in the event of a fire. Firestopping – ensuring all penetrations are sealed – is an important component of passive fire safety and help to ensure the effectiveness of your clean agent fire suppression system. To identify any other changes that could affect the volume and thus concentration of clean agent that might be needed to provide adequate protection. One example of this might be a renovation that has expand the area inside the enclosure. In this situation, it is important that the amount of clean agent necessary to protect the enclosure be recalculated. Anything that could result in the failure of the enclosure to hold the specified amount of clean agent must be immediately corrected – any penetrations must be sealed and sealed in such a way as to restore the original fire resistance rating of the enclosure. 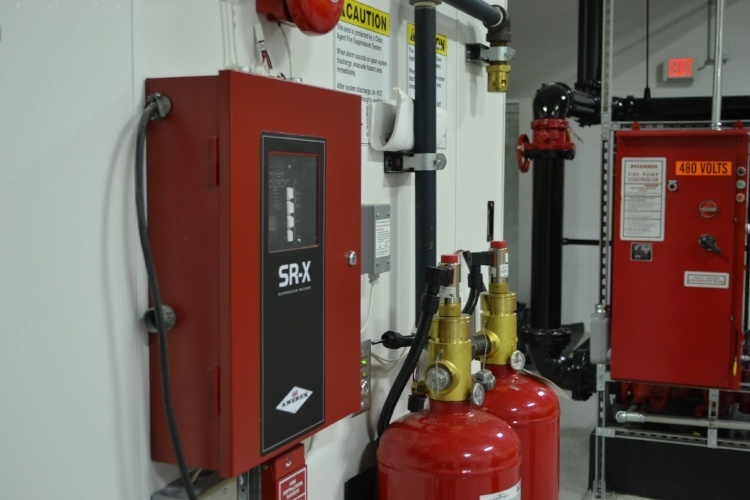 Your fire suppression system must be maintained in full operating condition at all times. You are required to notify the authority having jurisdiction (AJH) if your system is activated or found through inspection and testing to be impaired in any way. You are also required to notify the AHJ as soon as you have restored the system to working order. The Standard requires that any problems be addressed in “a timely manner consistent with the hazard”. While this requirement might seem somewhat ambiguous, remember always that the goal is to keep your system fully functional at all times. Therefore, any issue should be addressed as quickly as possible. The NFPA 2001 emphasizes the importance of training in clean agent fire suppression systems, both for the owner of the system and those who inspect and maintain it. Anyone who could be expected to operate clean agent systems should be trained on all the functions they might have to perform. While clean agent systems are generally safe when installed in accordance with design concentrations, training should also be provided for anyone working in an enclosure protected with a clean agent system to ensure they are aware of any potential safety issues related to the type of clean agent used. With regard to inspection and maintenance of clean agent systems, the NFPA 2001 specifically states that all persons who could be expected to inspect, test, maintain fire extinguishing systems must be trained and kept trained in the functions they are expected to perform. In addition, any new system must be reviewed and tested by qualified personnel to meet the approval of the AJH. Complying with these requirements is easy with Koorsen. Koorsen has decades of experience in designing, installing, inspecting, testing, and maintaining all types of fire suppression systems for businesses in almost every industry. Our fire suppression experts can answer any questions you may have about clean agent systems, and our factory-trained technicians can help you keep your system in compliance. Contact Koorsen today so you can be confident that your clean agent fire suppression system is providing the protection you need.